This is the third documentary I’ve seen by Thom Andersen, and the first not about the architecture of his hometown Los Angeles. The last one I saw was here at VIFF a couple years ago, a shortish look at billboards around town with a spinning radio dial soundtrack called Get Out of the Car, the first was the magisterial Los Angeles Plays Itself, about the depictions of the city through the years in Hollywood films, a slyly witty examination of how film transforms, misrepresents, ignores, violates and masks the city he loves. 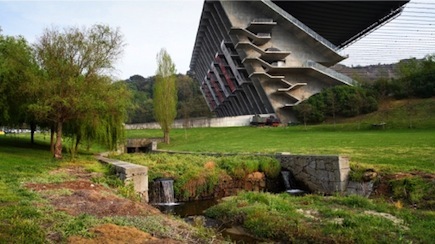 But this year, Andersen has traveled halfway around the world to examine the work of Portuguese architect Eduardo Souto Moura, who mainly works in the north of the country, in and around the city of Porto. This is explicitly a rejection of the Romantic idealization of ruins: it’s not about reveling in the glory of the past, or the beautiful decay of all things, Souto Moura finds this attitude itself decadent. His art is about making the past a fundamental, functional part of the present. It’s not hard to see why an Angeleno, a man from a city the most notorious trait of which is that it is almost utterly without a visible past, would be fascinated by the idea. The most unusual element of the film is its photographic technique, frequently using a series of still frames, shot once or twice per second and then animated, looking like film projected at a single frame per second (or two seconds) rather than the normal film speed of 24 frames per second. According to the VIFF program notes, this results in a higher resolution image. I don’t really know how that’s supposed to work, I mostly just found the technique distracting. Really lovely review. Particularly the second to last paragraph's observations. Not as versed on architecture, or really art at all, but I like what Andersen does a lot. Like a lecture, but in language of conversation, images. Looking forward to whatever you end up seeing the last half of the fest! I'll definitely check out your coverage. It looks like so far this and When Night Falls are the only ones I've seen that you wrote about.